Big stars tend to stick together. They all require incredibly dense regions in which to form, but once they do, they do a great job of blowing away and ionizing any other gas and dust in the vicinity. This is why nebulas in distant galaxies are great tracers of massive star formation. The bigger and hotter the star, the more UV light it produces, the more it ionized a gas cloud, the more we see gorgeous nebula. So it’s no surprise that when I look at the nebula below, I can guess that the central stars are huge, outweighing our familiar Sun by a factor of 100. 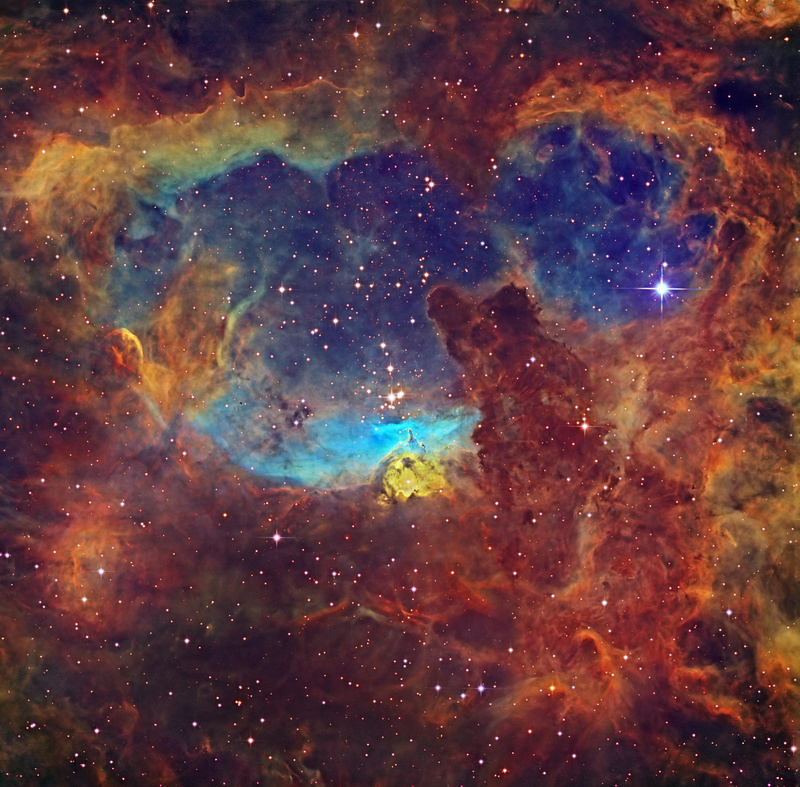 You can clearly see the cavity in the cloud carved out by the tight cluster of bright stars near the center. Also visible are pillars of dense gas right in the central (baby blue coloured) region that are obscuring more massive protostars that will eventually form, adding to the devastation of this cloud. When all the star formation is said and done, the winds from these stars will blow away the rest of the gas and dust, leaving a bright cluster. As the cluster members explode as supernovae, they will seed new star formation, while the longer lived low-mass cluster members will fly off into interstellar space, venturing away from the spiral arms of the galaxy. Imagine we had no understanding of what was going on in this image. We may compare it to a rainbow due to the colour. But an understanding of the mechanisms that form the stars, what the cloud is made of, stellar evolution; all of these things give us the power to see not just the image, but the past and future of this region. That is the true power of science.